In small bowl, dissolve yeast in warm water. In large bowl, mix brown sugar, butter, salt and hot water; cool 5 minutes. To cooled brown sugar mixture, beat in 3 cups of the whole wheat flour with electric mixer on low speed until moistened, scraping bowl frequently. Beat on medium speed 3 minutes, scraping bowl frequently. Beat in remaining 1 1/2 cups whole wheat flour and the dissolved yeast. With spoon, stir in 2 1/4 to 2 3/4 cups of the all-purpose flour until dough pulls cleanly away from side of bowl. On floured work surface, knead in remaining 1/2 to 1 cup all-purpose flour until dough is smooth and elastic, 10 to 15 minutes. Grease large bowl with shortening or cooking spray. Place dough in bowl; cover loosely with plastic wrap and cloth towel. Let rise in warm place (80°F to 85°F) 30 to 45 minutes or until light and doubled in size. Generously grease 2 (8x4- or 9x5-inch) loaf pans with shortening or cooking spray. Gently push fist into dough to deflate; divide in half. On lightly floured work surface, roll out each half of dough with rolling pin into 18x8-inch rectangle. Starting with one 8-inch side, roll up dough tightly, pressing with thumbs to seal after each turn. Pinch edge of dough into roll to seal; press each end with side of hand to seal. Fold ends under loaf; place seam side down in pan. Cover; let rise in warm place 30 to 45 minutes or until light and doubled in size. Heat oven to 375°F. Uncover dough; bake 30 minutes. Reduce oven temperature to 350°F; bake 10 to 15 minutes longer or until loaves sound hollow when lightly tapped. Immediately remove from pans; place on wire racks. Cool completely, about 1 hour. 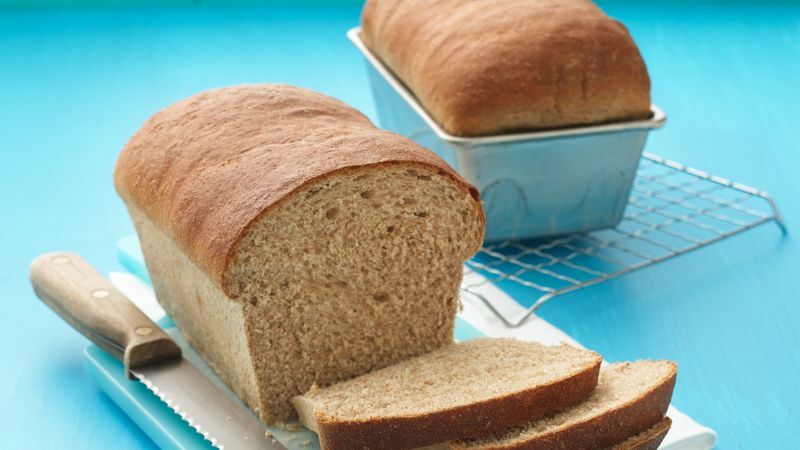 Whole wheat flour adds a nutty flavor, hearty texture and higher fiber content, and best of all, adds good-for-you whole grains in a tasty way.